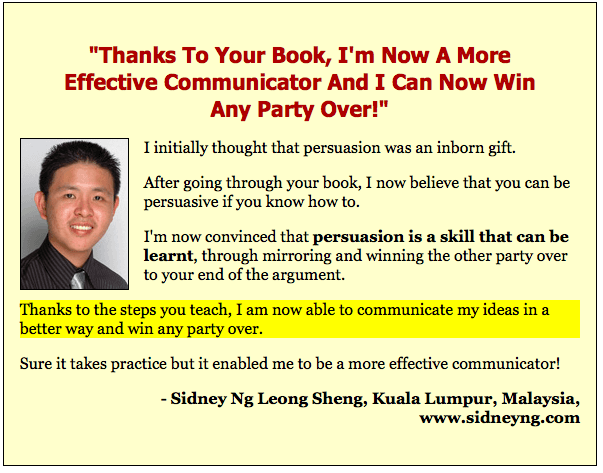 Would you agree that being more persuasive would help you out at work? How about at home? It helps you build a harmonious family, get better prospects at work, sell more products and inspire the people you truly care about. 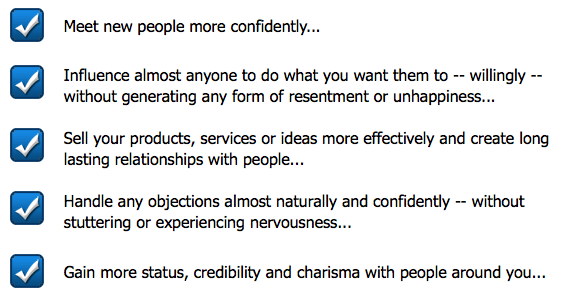 And contrary to popular belief, persuasion is not what people are born with. 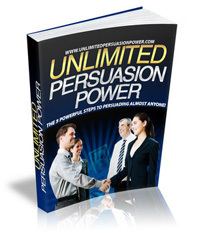 Persuasion is a powerful skill you can easily learn and master. 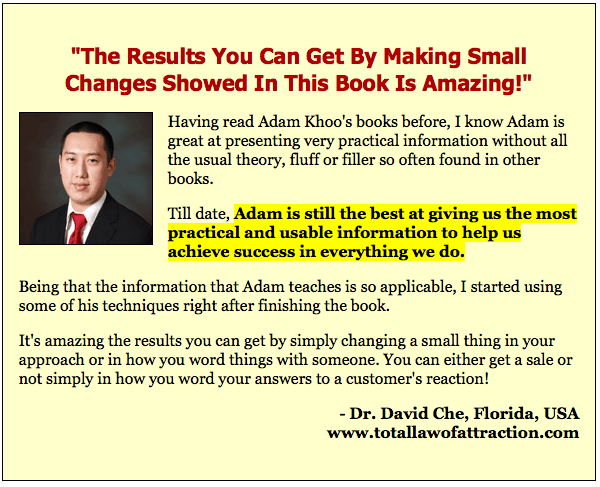 My name is Adam Khoo. 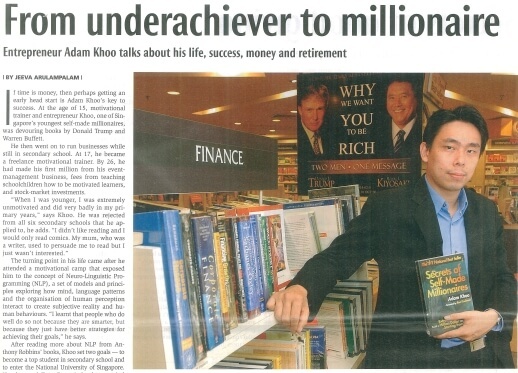 I’m a self-made millionaire at the age of 26 and a bestselling author of several books. When I just got started in my seminar business, I practiced day and night for my first preview session (where I’ll sell my actual seminar). And finally when the big day came, I gave the most dynamic presentation I have ever done. But guess how many people signed up? Only 1 — out of 80 people. It felt totally terrible. And it didn’t help knowing I was thousands of dollars behind because of the advertisements I’ve paid to get that 80 people into the room. I was desperate. I didn’t have anywhere to turn to. And I knew the only way to turn the whole situation around was to sell more of my seminar seats. 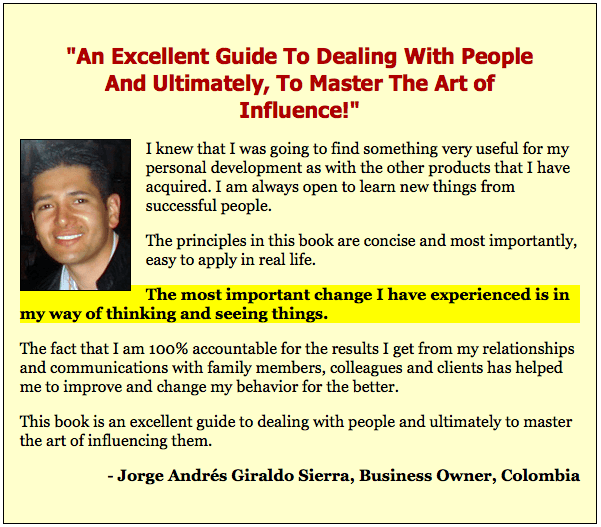 So I started reading almost every book I could find on Persuasion, Influence and Sales. Among the pile of books were “How to Win Friends & Influence People” by Dale Carnegie and “How To Sell Anything To Anybody ” by Joe Girard. I watched videos after videos of influential politicians giving historically famous speeches, and modeled after the most powerful trainers – the masters like Anthony Robbins. And it wasn’t long before I noticed 5 common steps all these masters take in persuading someone to do something – no matter is it to rally for support, to buy a product/service, or to sign up for their courses. 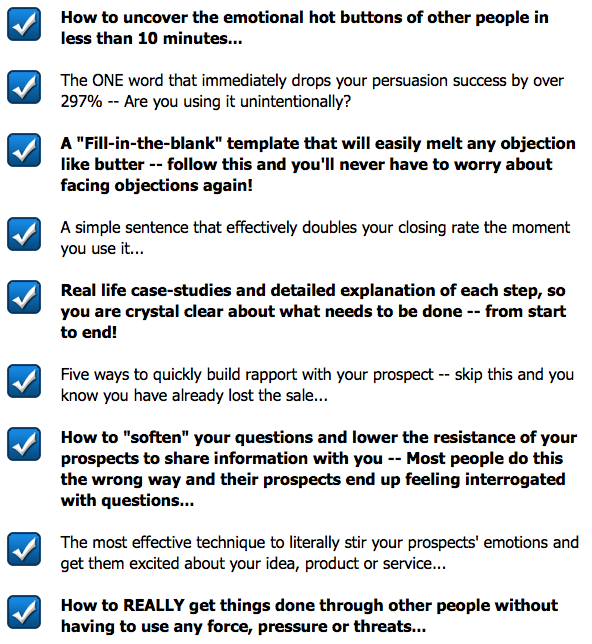 Knowing I have nothing to lose, I started applying these 5 steps into my next seminar preview. 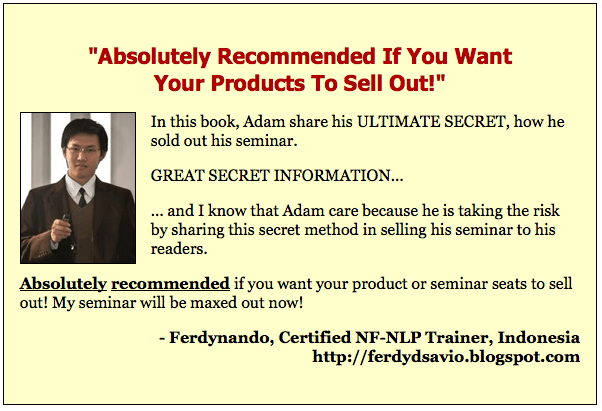 In my second preview session, 10 out of another 80 people signed up for my seminar! I couldn’t believe the results! I mean, each of the 5 steps was so simple and so I’ve never expected them to be that effective. 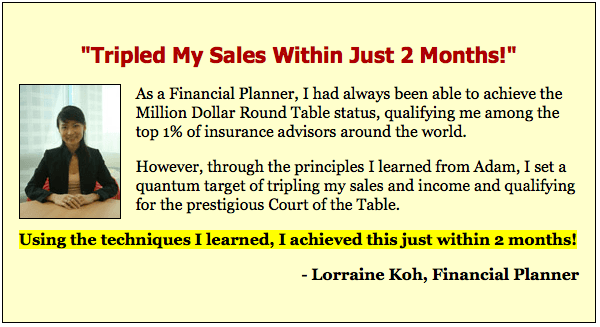 It Dramatically Improved My Relationships, Widened My Network… And Boosted My Net Worth! People were more open to my ideas… I was able to negotiate better deals for my company… and doors just begun opening one after another. 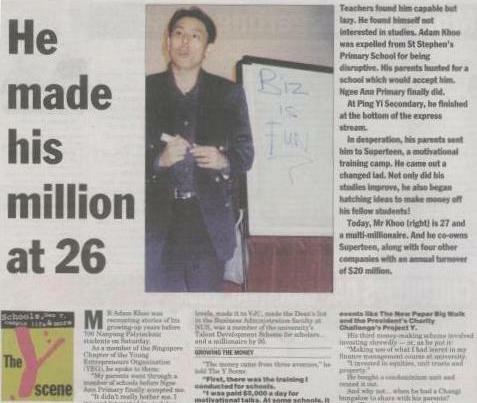 Fast forward a few years, I’m blessed to be part of a network of multi-millionaires and successful business owners… and my company is now one of the largest seminar companies in Asia. 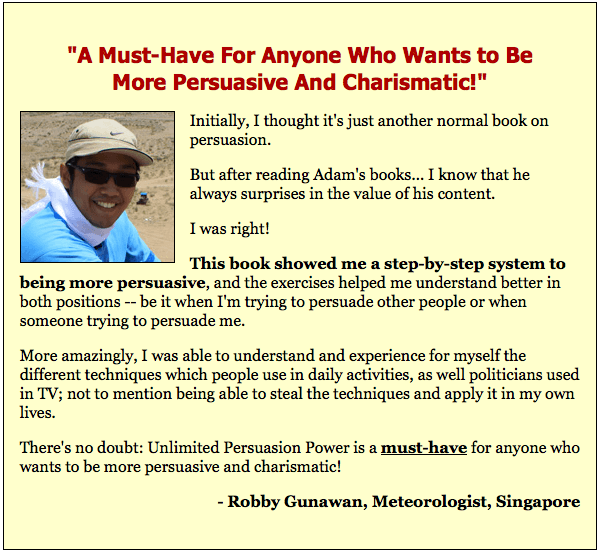 If you choose to, you could also put the persuasion formula to work for you right away. Listen, persuasion is NOT a talent. Rather, it’s a SKILL that my graduates and I have mastered to work wonders in our career, personal and family life. And if it has worked for hundreds of my graduates, it CAN work for you too. What if all of them could come true to you, how much differently will you be in a month from now? How about a year? Or five years? Then it shows you how YOU can apply it in YOUR life, so you can sell better — with lesser effort and resistance.